Cooking with Ian is one of my all time favorite things to do. Over the past few months, because of busy season, that has unfortunately been put on the back burner, but I am so excited to announce that busy season is officially over and we have started cooking together again! This past weekend was the first time we have been able to go to the farmers market this year in order to cook with fresh ingredients and it was amazing! Living in Georgia (and having parents that live in Florida) is extremely nice when it comes to farmers market shopping, and purchasing fresh food in general! A lot of our seafood and fresh produce comes Fresh from Florida – I see the Florida signs everywhere, even when I am shopping in Costco and I am so happy about that because I know the food is high quality. Florida farmers definitely make it easy to eat fresh produce (that tastes amazing) year-round! Step 1: Shuck and clean your corn. Roast it on the grill until charred and soft. Step 2: Dice your tomatoes, 1/2 jalapeño and onions and set aside in a bowl. Step 3: Cut your corn off of the cob and put it in the same bowl with the tomatoes and onions. Step 4: Chop up your cilantro and mix in the salsa. Add salt and pepper to taste. Step 1: Before you start your salsa, put your rice on the stove. Cook it according to the packaging. I did 1 cup of rice and 3 cups of water. Step 2: Once the rice is finished, fluff it with a fork, add the juice of 1 lime and salt to taste. Step 1: Portion out your cod and pat it dry. Step 2: Season with the salt, pepper and paprika on both sides. Step 3: Melt your butter in a skillet. Step 4: Add your cod to the hot skilled and cook three minutes per side over medium heat. 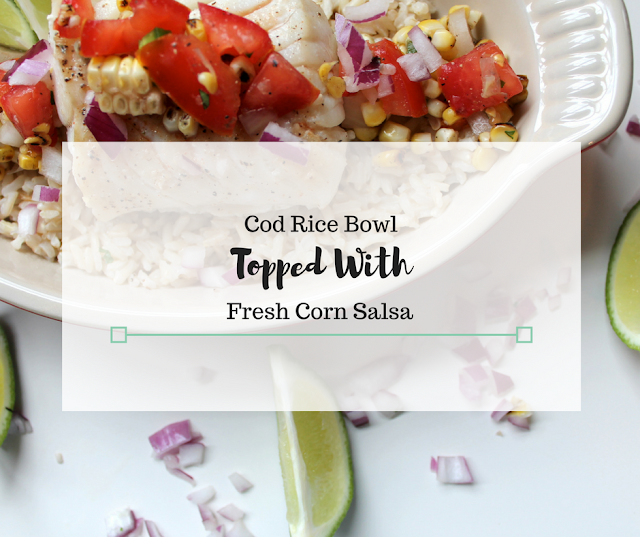 Add your rice to the bottom of your dish. On top of the rice, place your cod and top with the fresh corn salsa. Sprinkle your red onion around the dish and serve with sliced lime wedges. Enjoy!! 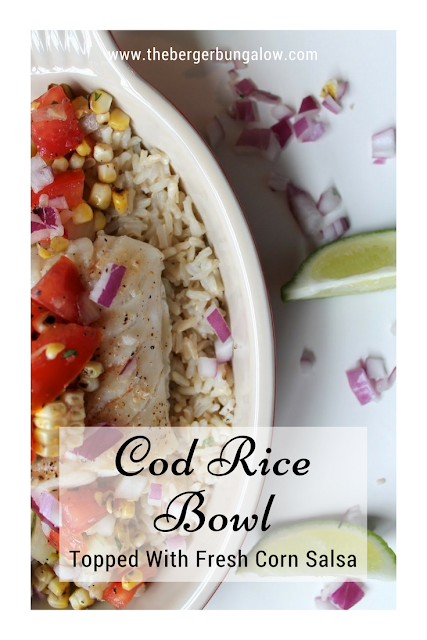 This recipe is an extremely easy way to make a healthy and fresh meal for dinner on any night. Don’t forget to shop for Fresh From Florida products and you can also follow the Fresh on social media to see their Fresh! recipe videos.